Released Sept. 2011, Sublime Dezine Records. 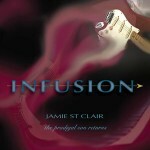 Vocal jazz rock from Jamie St Clair: INFUSION: The Prodigal Son Returns. Style = Ry Cooder meets Crosby, Stills, Nash, Young. Jamie has collaborated again with a crew of world musicians, Prem Joshua (sitar, flute), Kit Walker (jazz piano, bass), Suvarna Freeman (vocals), Maniko (vocals), and Praashekh Borker (sarod). This music combines the jazz elements from Kit Walker and Jamie with the Indian (Eastern) elements Jamie was immersed in when living in the spiritual ashram of Osho, in the 80s and 90s, including a searing electric rap song, Osho Rocks, about the crazy wisdom teacher, Osho, and covers of Mark Knopfler (Boom Like That), Steely Dan (Do it Again), and Dylan’s All Along the Watchtower. Tilopa Publishing. Submit licensing inquiries on Tilopa Publishing online.